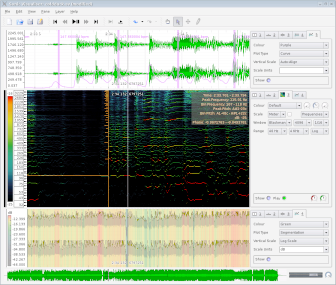 Sonic Visualiser is an application for viewing and analysing the contents of music audio files.5th May 2011: Sonic Visualiser 1.9 has been released. The aim of Sonic Visualiser is to be the first program you reach for when want to study a musical recording rather than simply listen to it.We hope Sonic Visualiser will be of particular interest to musicologists, archivists, signal-processing researchers . It is the first program you reach for when want to study musical recording. Sonic Visualiser is Free Software, distributed under the GNU General Public License (v2 or later) and available for Linux, OS/X, and Windows. Sonic Visualiser was developed at the Centre for Digital Music at Queen Mary, University of London. Sonic Visualiser 1.9 showing a waveform pane and a melodic range spectrogram pane. Overlaid on the spectrogram is a note layer, showing the output of a note-tracker Vamp plugin that is being evaluated. The notes from the tracker are played using a piano sample, configured in the plugin dialog visible. Burns mp3/wma/wav files with easy. Sonic Progress Bar Control replaces your old control with new Stylish control. Qweas is providing links to Sonic Visualiser 1.9 as a courtesy, and makes no representations regarding Sonic Visualiser or any other applications or any information related thereto. Any questions, complaints or claims regarding this application Sonic Visualiser 1.9 must be directed to the appropriate software vendor. You may click the publisher link of Sonic Visualiser on the top of this page to get more details about the vendor.